The newly established Alaska Harmful Algal Bloom Network (AHAB) provides statewide awareness of harmful algal blooms. 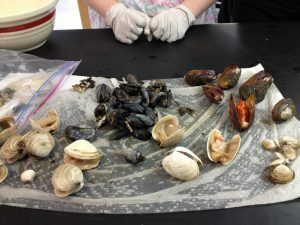 In Alaska, commercially harvested shellfish sold in stores and restaurants meet federal Food and Drug Administration-approved and state-run toxin testing requirements and are safe to eat. However, there is no routine testing of shellfish for personal and subsistence shellfish harvest. While there is no way to guarantee safety of personal and subsistence harvested shellfish, the AHAB Network is helping to inform and educate Alaskans about risks associated with harmful algal blooms (HABs). Through the network, partners are able to assemble data across regions to explore the impact of a changing climate on HAB occurrence and intensity. Further, AHAB supports investigations of the role of HABs in marine animal mortalities and promotes efforts to understand impacts on key species like walrus, whales, and seals. A long-term goal of the AHAB Network is to support the development of HAB risk assessments and forecasts. Since an initial kick-off planning meeting in 2016, state agencies, Alaska Native organizations, the University of Alaska, Alaska Sea Grant, Alaska Ocean Observing System (AOOS), Kachemak Bay National Estuarine Research Reserve, and the National Centers for Coastal Ocean Science (NCCOS) have collaborated in the development of the AHAB Network. In early February 2017, AHAB unveiled its public website (http://www.aoos.org/alaska-hab-network) to promote greater awareness of the impacts of HABs and sharing of data from active research and monitoring programs across Alaska. NCCOS staff are supporting the development of AHAB with service on the Executive Committee and Working Groups, as well as general HAB research, monitoring, and event response in the state. The AHAB network also leverages NCCOS facilities and internal and external investments in research and monitoring in Alaska. For more information, contact Marc.Suddleson@noaa.gov. Spring into NCCOS Science Dive Training in Alaska!